Exhibit: May 26 – July 29, 2017, to be held at Houston Center for Contemporary Craft, Houston, Texas, USA. 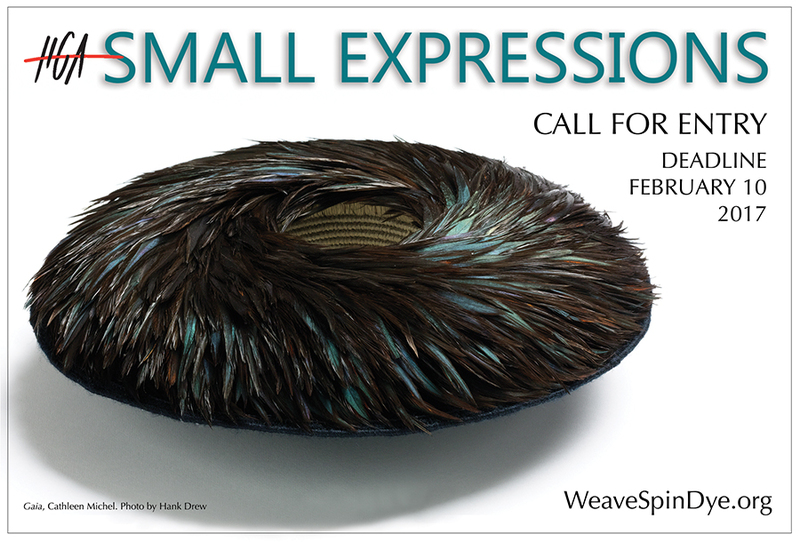 Small Expressions is an annual, international, juried exhibit sponsored by the Handweavers Guild of America, Inc. (HGA) to showcase contemporary small scale works created using fiber techniques in any media, not to exceed 15 inches (38 cm) in any direction including mounting, framing, or display devices. Juried by Mary Ruth Smith, a Professor at Art at Baylor University, the exhibit will be heldMay 26 – July 29, 2017 at the Houston Center for Contemporary Craft in Houston, Texas, USA. Entry fees are $32 for HGA Members (Join Now) and $47 for Non-Members. Students attending an accredited educational institution may enter with no fee. For more information visit our website or email Linda Campbell, HGA Exhibit and Editorial Assistant. Olympia bead weaver, Teresa Sullivan, is the Olympia Weavers Guild featured speaker February 17th. She will discuss the status of craft within the art world and share her artwork and it’s influences with a Trunk Show.